The Endopterygota are among the most diverse insect superorders, with about 850,000 living species divided between 11 orders, containing insects such as butterflies, flies, fleas, bees, ants, and beetles. 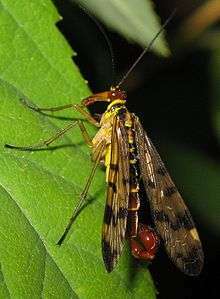 They are distinguished from the Exopterygota (or Hemipterodea) by the way in which their wings develop. Endopterygota (meaning literally "internal winged forms") develop wings inside the body and undergo an elaborate metamorphosis involving a pupal stage. Exopterygota ("external winged forms") develop wings on the outside of their bodies and do not go through a pupal stage. The latter trait is plesiomorphic, however, and not exclusively found in the exopterygotes, but also in groups such as Odonata (dragonflies and damselflies), which are not Neoptera, but more basal among insects. The Endopterygota are sometimes divided into three assemblages: Neuropteroida (Neuroptera, Megaloptera, Raphidioptera, and Coleoptera), Hymenopteroida (Hymenoptera), and Panorpoida (Siphonaptera, Diptera, Trichoptera, Lepidoptera, Strepsiptera, and Mecoptera). The hymenopterans, with their highly developed social systems, were believed to have constituted the most advanced insects, despite their rather "primitive" anatomy compared to flies and beetles, for example. ↑ Rolf G. Beutel; Hans Pohl (2006). "Endopterygote systematics – where do we stand and what is the goal (Hexapoda, Arthropoda)?". Systematic Entomology. 31 (2): 202–219. doi:10.1111/j.1365-3113.2006.00341.x. ↑ A. Nel; P. Roques; P. Nel; J. Prokop; J. S. Steyer (2007). "The earliest holometabolous insect from the Carboniferous: a "crucial" innovation with delayed success (Insecta Protomeropina Protomeropidae)". Annales de la Société Entomologique de France. 43 (3): 349–355.